Two words describe my reaction when artist and lecturer Luanne Stovall and I met for the first time over coffee last year to discuss her idea of a community wide pie social to celebrate the Martin Luther King Jr. holiday: Shock and Awe. Since 1995, Stovall had been serving pie to friends and family as a way of coming together to celebrate Dr. King's birthday, but last year she moved the homage into the public domain by inviting the members of Sweet Home Mis­sionary Baptist Church to host an inaugural Dream Pie Social. 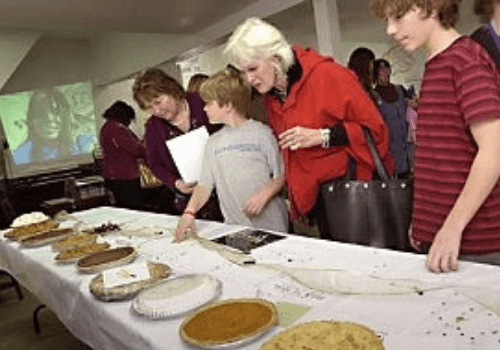 The Clarksville church, which was founded by freed slaves, agreed, and on Jan. 17, 2009, homemade pies, a children's program, and a silent auction generated a lively gathering of 200 participants, good will, and conviviality and raised $1,000 for a much needed handicap access ramp for the church.